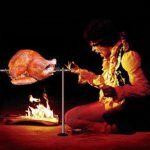 November 27 is Thanksgiving, but in some circles it is equally famous for being the birthday of Jimi Hendrix. After all, November 27 is only occasionally Thanksgiving, but it is always Jimi’s birthday. He would be 72 this year, hard as that is to believe, and despite the purple haze and voodoo chile, the marketing of the Hendrix name goes on, stronger today than ever. Check Ask.Com and you’ll see some 5 MILLION results, including some 700,000 on the topic of Hendrix marketing. Not bad for a guy who has been on the wrong side of the daisies for over 40 years! Happy birthday Jimi!